The road to fitness can be like driving the interstate. You’re cruising along, getting to your destination in record time and you’re feeling fine. But suddenly you hit bumper-to-bumper traffic, and your trip grinds to a halt. One of the inevitable facts of fitness is that everyone eventually hits a plateau when muscle and strength gains slow down, body weight stabilizes and post workout soreness is no longer a factor. This sudden lack of advancement can make working out feel like a waste of time, and it’s at this point that beginners might be tempted to quit altogether. No matter your experience level, this leveling off period will set in about 6 weeks after starting a new routine. There are many reasons your body reaches this state of suspended animation. Repetition and boredom are often the biggest culprits. Most people fall into a routine where they perform the same exercises at the same weight in the same order at every workout. While there’s comfort in such familiarity, your body quickly adapts to the same old same old, resulting in diminishing returns. Overtraining can also be blamed. 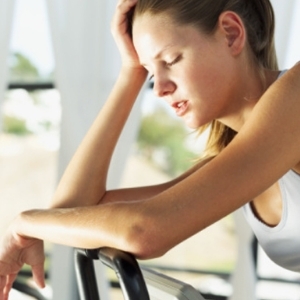 When the body is given little chance to recover from intense exercise, it will eventually stop cooperating. Lack of proper sleep and nutrition will also keep you from getting the next level. Keep Your Body Guessing: Fortunately, there are easy ways to work through plateaus and a good start is by shaking up your routine on a regular basis. Change the intensity, weight, and training method. If you usually use machines, try free weights. If you always use a curl bar for biceps, switch to dumbbells. Change the order of your exercises. Continually introduce new exercises into your routines. You get the picture. The possibilities are endless. The idea is to keep the muscles constantly challenged. So working through plateaus is also a good time to accent the weak links that may also be holding you back from advancing. Weak triceps will affect your chest performance, just like a weak lower back will compromise your ab workout. Strengthening the secondary muscles goes a long way to overall strength and size gains. Switch Up The Cardio: These plateau busting principals also hold true for aerobic exercises. Most gyms have a wide variety of cardio machines, so mix it up. If you’re a treadmill runner, work the elliptical or Stairmaster machines into your routine, although those with knee issues may want to avoid the Stairmaster. Interval training, which is a series of one-minute sprints followed by a minute of rest, is also a great way to lively up your cardio workout. This 20 to 30 minute (or however long you like) workout can be used on any of the cardio machines and is also a great fat burner. Do Something Different: Another way to bust out of a plateau is to take a week off from the gym and engage in exercises like biking, hiking, yoga or running. This concept of “active rest” will break you out of your gym routine and make use of muscles that may not be engaged during your regular workout. It’ll also give you new enthusiasm once you return to the gym. When put into proper perspective, plateaus can actually be a good thing, as they force you to shake things up a bit. In exercise as in life, familiarity can breed contempt. Constantly introducing new exercises and techniques will keep your workouts fresh, fun, and most importantly, productive.